Download "Taylor Review. 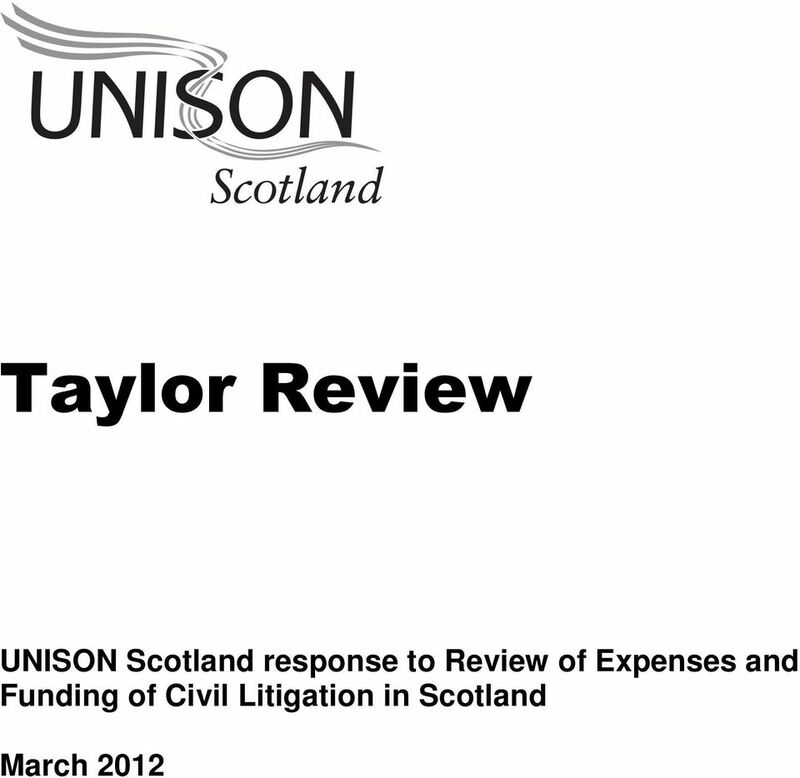 UNISON Scotland response to Review of Expenses and Funding of Civil Litigation in Scotland"
2 Taylor Review UNISON Scotland response to Review of Expenses and Funding of Civil Litigation in Scotland This response is by UNISON Scotland, the largest public sector trade union in Scotland with 160,000 members. UNISON members work in the health service, local government, police and fire services, national regulatory bodies and the community and voluntary sector. The provision of a legal service has always been a key and core benefit of trade union membership. We recognise that accidents, injury and disease impact not only upon our members who are injured but also their families. We recognise that obtaining redress for members who suffer workplace accidents, injury or disease is vitally important for the individual but also serves an essential role in terms of wider workplace health and safety. Our experience shows that bringing claims for workplace accidents, injury and disease can and does have a positive impact upon workplace safety. Accordingly the civil justice system and access to civil justice are key concerns for us and for all of our members. The legal service we provide to our members, and therefore their ability to access justice, are reliant upon the recovery of legal expenses by our solicitors in successful cases. 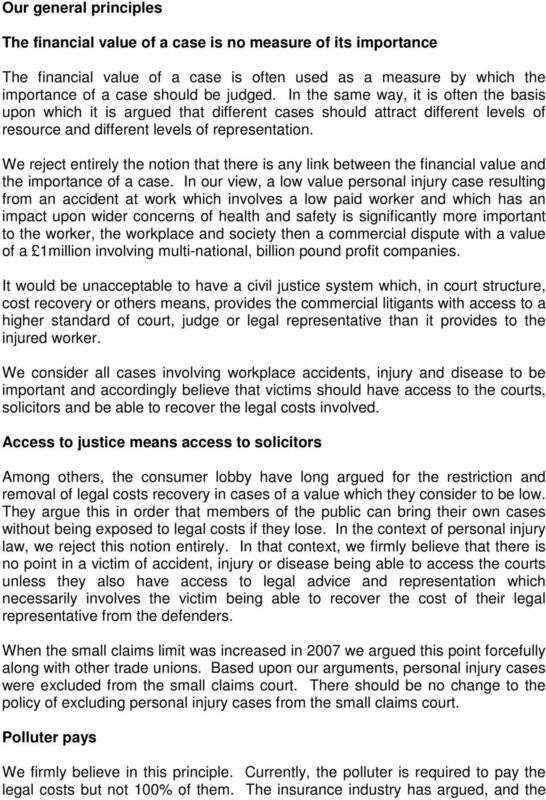 Any changes which would reduce cost recovery for any of our members cases would have a profoundly damaging effect to the service we are able to offer and thereby to our members ability to access justice. This consultation document is therefore of great importance to us and to our members. We acknowledge that the consultation document asks a large number of questions, many of which are technical in nature. We do not accordingly intend to address each question specifically. Firstly we will deal with matters of general principle, discussing those set out in the consultation document and also setting out the general principles which we believe should underpin our civil justice system and the question of legal cost recovery. 4 arguments are noted in the consultation document, that legal costs are too high in certain cases and, on occasion, disproportionate to the principle sum. 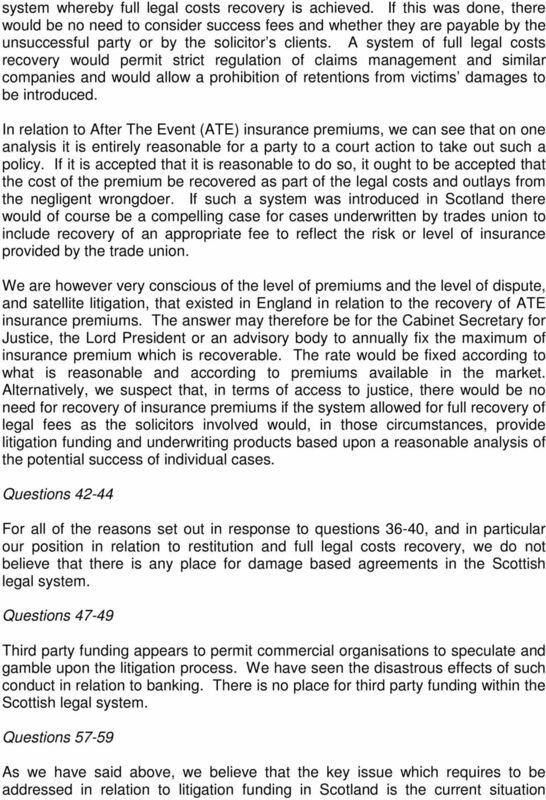 The insurance industry are therefore seeking to restrict significantly the legal costs which can be recovered in certain cases at certain values, The argument advanced by the insurance industry is however fundamentally flawed because it overlooks one very important aspect: Raising a court action for compensation is only done as a very last resort and only after there has been an injury which the insurers have refused to deal with pre-litigation. Before we instruct our solicitors to raise court proceedings on behalf of one of our members, the following will have occurred: The employer will have breached the health and safety standards expected; and injury will have occurred; the insurers will have refused to deal with the matter at all or made an unacceptably low offer. Therefore, the employer and the insurer will have had every opportunity to avoid court proceedings being raised against them and being required to carry the cost of those court proceedings. In those circumstances there is no place for the court system being changed to reduce their exposure to legal costs. The polluter should be forced to pay and to pay fully. 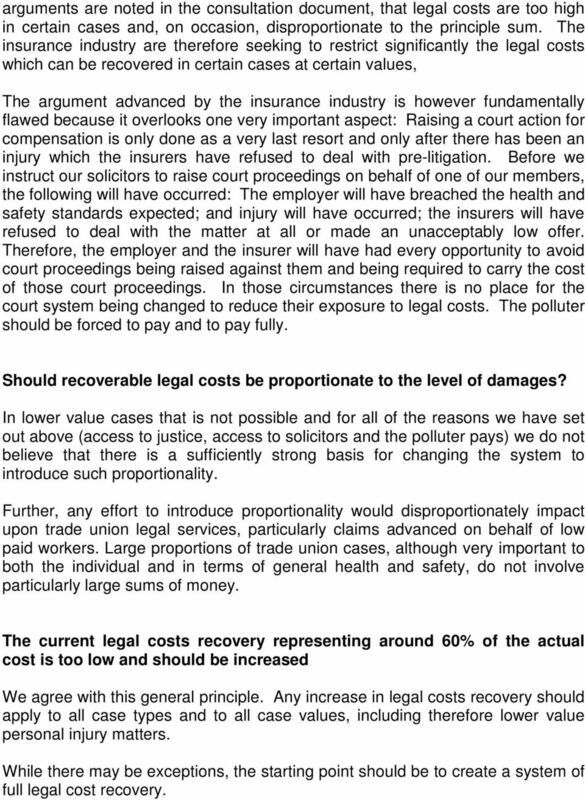 Should recoverable legal costs be proportionate to the level of damages? In lower value cases that is not possible and for all of the reasons we have set out above (access to justice, access to solicitors and the polluter pays) we do not believe that there is a sufficiently strong basis for changing the system to introduce such proportionality. Further, any effort to introduce proportionality would disproportionately impact upon trade union legal services, particularly claims advanced on behalf of low paid workers. Large proportions of trade union cases, although very important to both the individual and in terms of general health and safety, do not involve particularly large sums of money. The current legal costs recovery representing around 60% of the actual cost is too low and should be increased We agree with this general principle. Any increase in legal costs recovery should apply to all case types and to all case values, including therefore lower value personal injury matters. While there may be exceptions, the starting point should be to create a system of full legal cost recovery. 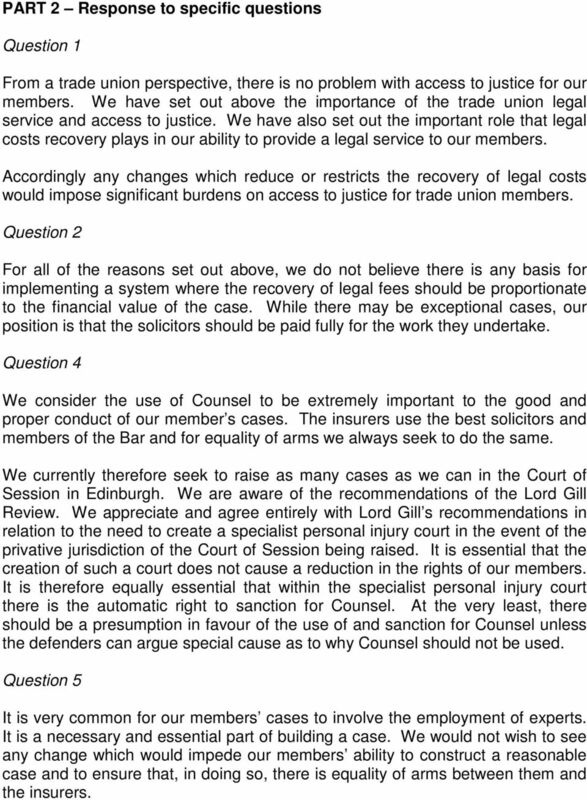 5 PART 2 Response to specific questions Question 1 From a trade union perspective, there is no problem with access to justice for our members. 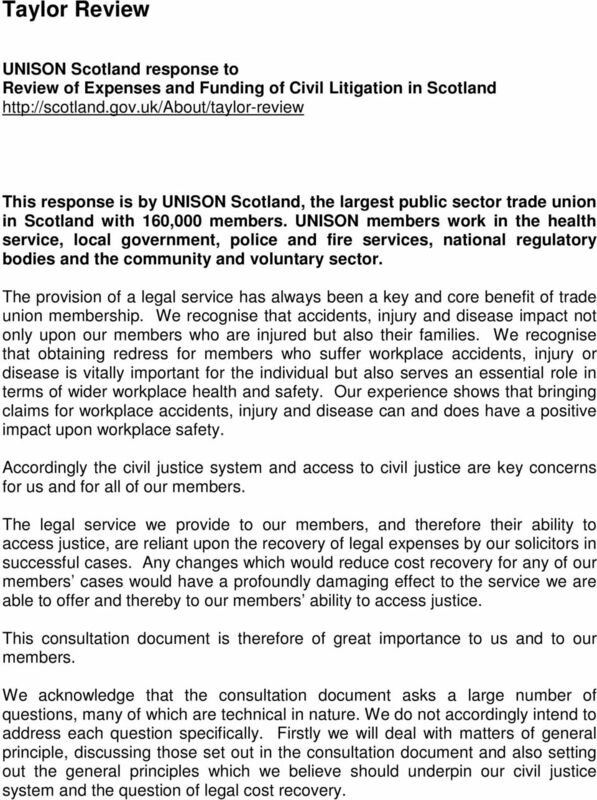 We have set out above the importance of the trade union legal service and access to justice. We have also set out the important role that legal costs recovery plays in our ability to provide a legal service to our members. Accordingly any changes which reduce or restricts the recovery of legal costs would impose significant burdens on access to justice for trade union members. 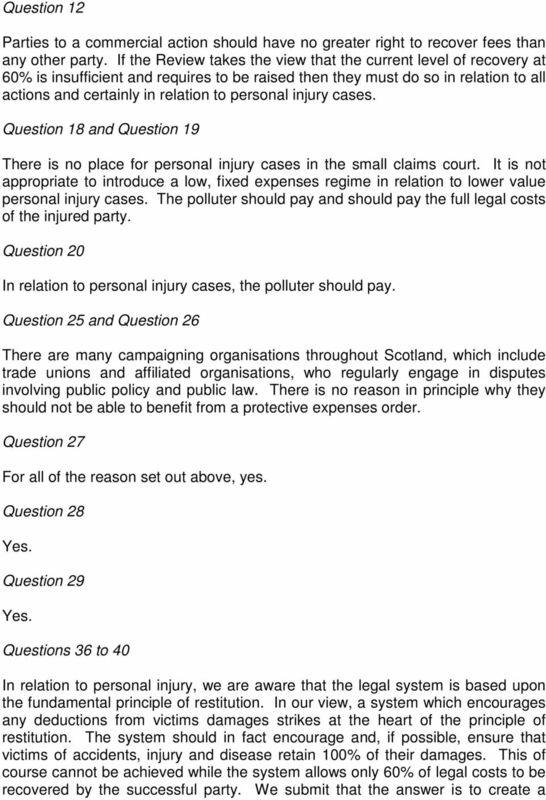 Question 2 For all of the reasons set out above, we do not believe there is any basis for implementing a system where the recovery of legal fees should be proportionate to the financial value of the case. While there may be exceptional cases, our position is that the solicitors should be paid fully for the work they undertake. Question 4 We consider the use of Counsel to be extremely important to the good and proper conduct of our member s cases. The insurers use the best solicitors and members of the Bar and for equality of arms we always seek to do the same. We currently therefore seek to raise as many cases as we can in the Court of Session in Edinburgh. We are aware of the recommendations of the Lord Gill Review. We appreciate and agree entirely with Lord Gill s recommendations in relation to the need to create a specialist personal injury court in the event of the privative jurisdiction of the Court of Session being raised. It is essential that the creation of such a court does not cause a reduction in the rights of our members. It is therefore equally essential that within the specialist personal injury court there is the automatic right to sanction for Counsel. At the very least, there should be a presumption in favour of the use of and sanction for Counsel unless the defenders can argue special cause as to why Counsel should not be used. Question 5 It is very common for our members cases to involve the employment of experts. It is a necessary and essential part of building a case. We would not wish to see any change which would impede our members ability to construct a reasonable case and to ensure that, in doing so, there is equality of arms between them and the insurers. Keoghs LLP response to the Legal Services Board consultation: Referral fees, referral arrangements and fee sharing. RESPONSE by ALLAN McDOUGALL, SOLICITORS to Consultation on Damages Claims (EU Directive on Safety and Health at Work) (Scotland) Bill. 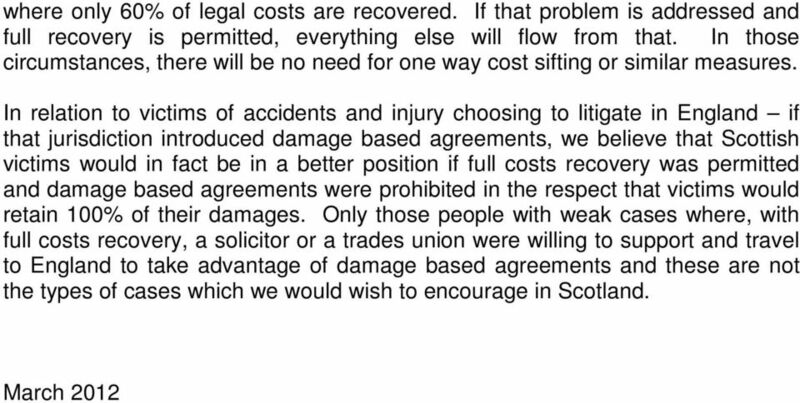 RESPONSE by ALLAN McDOUGALL, SOLICITORS to Consultation on Damages Claims (EU Directive on Safety and Health at Work) (Scotland) Bill. Introduction This Response is submitted by Allan McDougall, Solicitors. ALERT U.K. EMPLOYERS LIABILITY A GUIDE INTERNATIONAL WHAT IS EMPLOYERS LIABILITY INSURANCE? REFORMING THE COMPENSATION SYSTEM A BETTER DEAL FOR CONSUMERS October 2010 REFORMING THE COMPENSATION SYSTEM A BETTER DEAL FOR CONSUMERS 3 This is not access to justice this is incitement to litigate. 1. What are the main reasons relating to the cost of litigation that discourage potential litigants from court action?